Buy of REUK SUPER TIMER. Every day we receive requests for 12VDC powered repeating timers with various ON and OFF durations designed to control a huge array of different items including irrigation systems, aquarium pumps, battery chargers, testing systems, heating and cooling systems, feeders, and much more. The new REUK Super Timer has been designed to meet these and other requirements while enabling the user to set their own ON and OFF durations for maximum flexibility. The REUK Super Timer is hand made and rigorously tested before despatch. Our latest multi function REUK Super Timer 3 MINI version (pictured below) is now available in the REUK Shop. Click here for all the information and/or to buy an REUK Super Timer 3 MINI now. The REUK Super Timer can be programmed with ON and OFF durations of 1-99 seconds, 1-99 minutes, or 1-99 hours. The ON and OFF durations do not have to have the same units or the same values – e.g. it is possible to have a timer which is on for say 3 seconds and then off for 7 hours etc. Therefore, for most repeat relay timer applications the REUK Super Timer will be suitable – however, if you require a timer which can be programmed with an ON duration of say exactly two and a half minutes, this is not the product for you (since you could set the ON time to be 2 minutes or 3 minutes, but not 2 1/2 minutes). If the REUK Super Timer is not suitable for your needs, please contact neil@reuk.co.uk with details of your exact requirements and we can put together a special order for you for around the same price. The REUK Super Timer is designed to be powered by 12VDC from either a battery (solar charged or otherwise) or a 12VDC mains transformer – available here: 12VDC 500mA Power Supply. 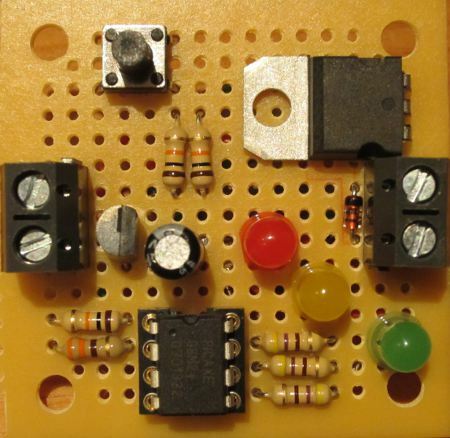 It is possible to power the timer safely with an input voltage of approximately 10-16VDC. 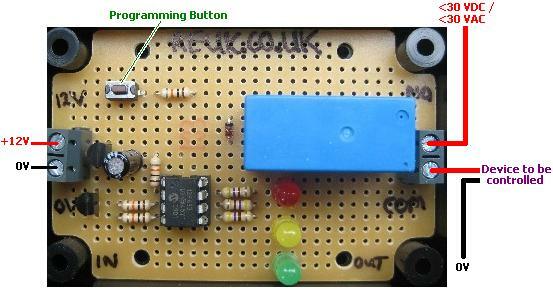 Below 10VDC the relay switch will not close and so the timer will not do anything; above 16VDC the relay and other components on the circuit board could be permanently damaged. During OFF cycles the timer draws no more than a couple of milliAmps, and during ON cycles it draws around 40mA (= 0.5 Watts @ 12VDC). The relay fitted to this circuit is rated at 10 Amps (10A @ <250VAC or 10A @ <30VDC), however we only recommend it be used to switch low voltages of <30VDC or <30VAC. If you intend to switch a higher voltage e.g. mains electricity, then we accept your purchase of this item only on the condition that a qualified electrician makes the necessary connections and checks over the circuit and any enclosure you put it into to confirm that everything is correctly earthed and insulated, and that it meets all current safety regulations. Although the rating of the relay is 10 Amps, if you intend to switch an inductive load (anything which generates a magnetic field – e.g. a motor, pump, solenoid, relay etc), the relay should not be used if the device is rated at more than around 4-5 Amps since at start up a surge current in excess of the 10A rating could damage the relay and circuit board. If you have a device to switch which requires a larger relay, either contact neil@reuk.co.uk and request the MOSFET version of this circuit to which you can connect a suitably rated automotive relay, or simply use the on board relay to switch a suitably rated secondary relay (as illustrated above). 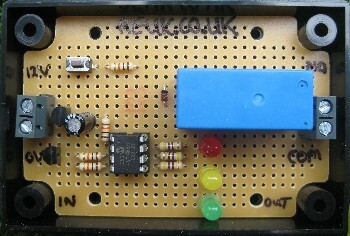 For the first 10 seconds after the circuit is connected to the power the yellow LED will be lit. During this time it is possible to re-programme the ON and OFF durations of the relay. Press the button once and the yellow LED will turn off. This confirms that you have entered programming mode. For the ON and OFF durations you must enter first the timing units (hours, minutes, or seconds), and the two digit number of those units – e.g. 03 or 47 (from the range 01 to 99). The red LED will light up for 2 seconds. If you want to enter a ‘0’ then press the button while the red LED is on. When the red LED turns off, the green LED will start flashing – on for 1.5 seconds, then off for 0.5 seconds. If you want to enter a ‘1’ then press the button while the green LED is lit for the first time. To enter a ‘2’, wait until the green LED turns on for the second time and press the button. To enter a ‘3’ press the button the third time the green LED lights up…and so on. When you press the button the green LED (or red LED if you are entering a ‘0’) will immediately turn off, and the yellow LED will light up and stay on for one second. This gives you visual confirmation that your input has been accepted and tells you to get ready to enter the next value. When the yellow LED turns off and the red LED lights up again repeat as above to enter the next value. If you make a mistake while programming, just disconnect the circuit briefly from the power and start again. It is much easier to programme the timer if you prepare yourself beforehand by working out and writing down the six values in order so that you are ready to enter them. before you programme the timer – note that ‘red’ is written rather than ‘0’ so you remember to press the button when the red LED is on. If you enter a number greater than 9 for the tens or ones, ‘9’ will be saved. If you enter a number greater than 2 for the time units, ‘2’ will be saved – i.e. your timer will be programmed in seconds. When you have programmed all six values, the timer will immediately start with the ON cycle closing the relay with the green LED on. When the OFF cycle starts, the green LED will be off. As long as the timer remains connected to the power, it will continue to repeat the ON and OFF cycles with the programmed settings. The programmed ON and OFF durations are stored in non volatile memory, and so will be retained even when you disconnect the circuit from the power. Therefore, you only need to go through the programming steps if you want to change the ON and/or OFF duration for some reason. The accuracy of the timer is better than around 1%, i.e. over the course of an hour the timer may gain or lose 30 or so seconds (usually far less). Therefore the timer is not suitable for use where exact timings are required – e.g. if you want something to be turned on at exactly the same time every day (since the times will drift over days and weeks).